This week Amy invites us to welcome the new month with her Hello April post- which here in the US means the beginning of spring. I was excited to be ushering in the season out west this year, spending time with friends and family . 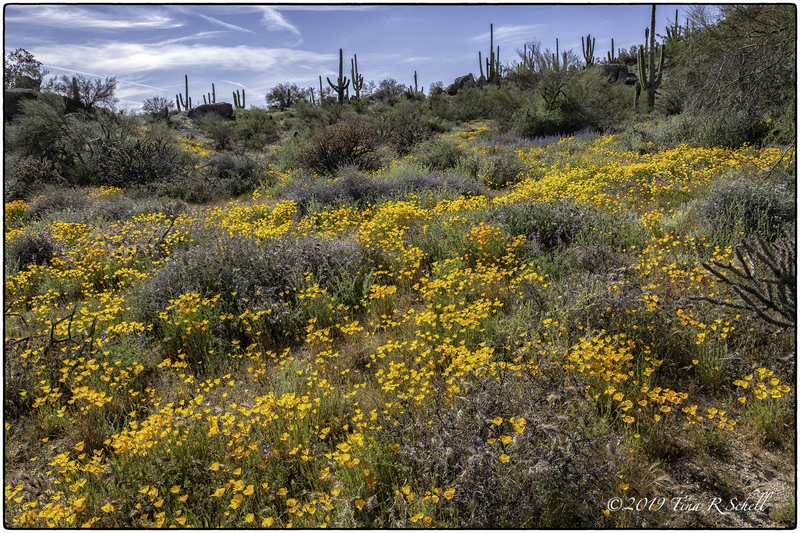 Apparently, this past winter in the desert was chillier and wetter than normal so there is an amazing preponderance of glorious flowers to see and enjoy. 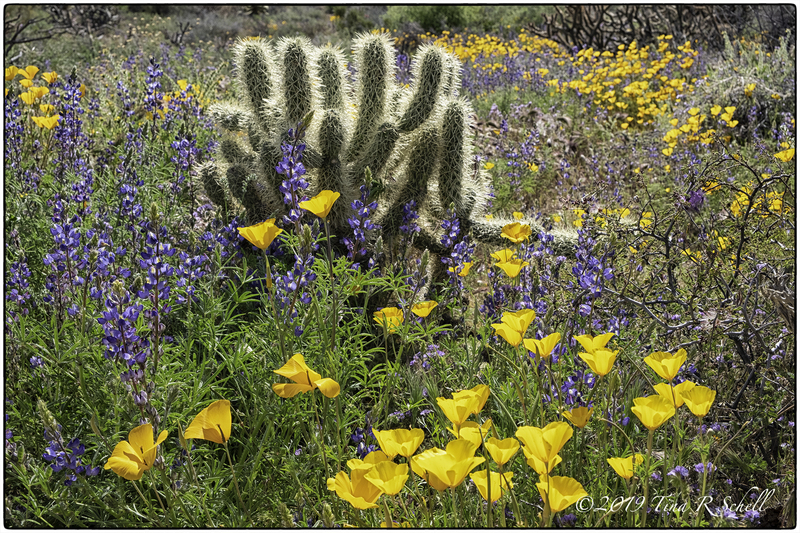 Much of the news during our visit was about the “super bloom” – a rare occurrence during which there are literally blankets of wildflowers covering the hills and roadsides around much of California and Arizona. Yellow and red poppies were surrounded by blue and purple lupines and pink fairydusters among other species too numerous to name. Reports of towns being overwhelmed by tourists and photographers were heard daily, although we were fortunate to be with locals who knew the best times and places to avoid the crowds. Sadly, not everyone affords nature the respect she deserves, and officials have had to post warnings under #dontdoomthebloom to ask people not to trample or pick the flowers. How sad. 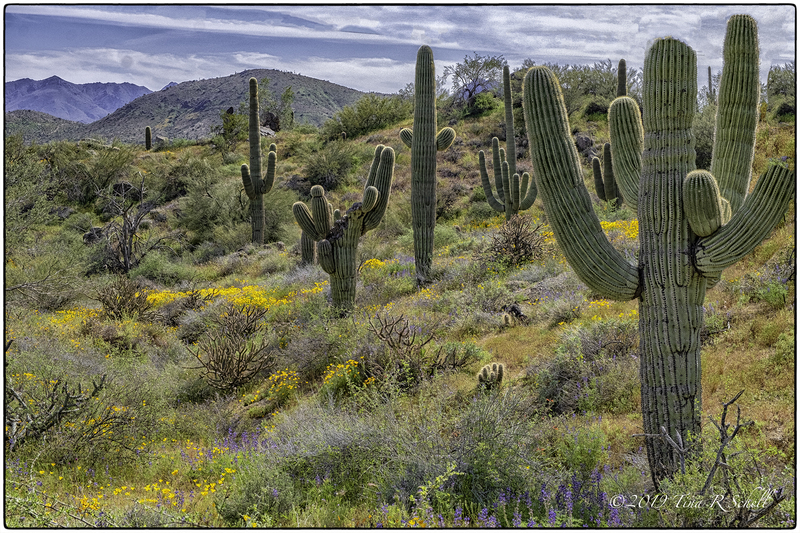 In addition to the glorious floral carpets, the scenes were enhanced by the ever-present cacti – standing guard like soldiers with their prickly exteriors. Arms outstretched toward the desert sun, they seemed a bit battered and bruised by the harsh conditions and yet still they stood, ever vigilant. 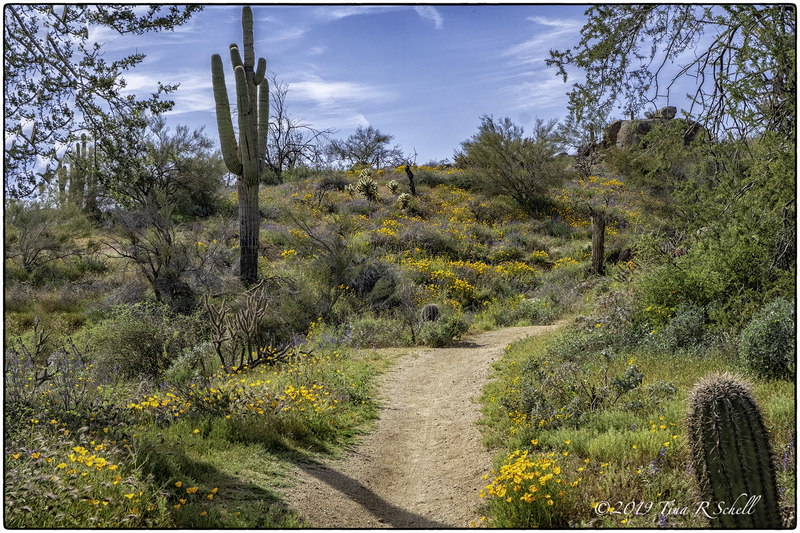 Beyond the beauty of the flowering desert, we were blessed with clear blue skies and perfect temperatures for hiking. The far-drier desert air is a bit challenging for those of us who live at sea level, but I personally found it less difficult than the change of time zone. As easy as it is to adapt when traveling west, the return to eastern time is definitely not for the faint of heart. Now that we’ve returned home, I’m happy Amy has given me an opportunity to share some of the desert’s magic with her challenge. Hopefully you are enjoying similarly beautiful weather wherever this post finds you. We look forward to sharing April with you in your part of the world. Remember to Tag your post Lens-Artists so that we can all find you in our reader section. We’ll be back next week and hope you’ll join us here on Travels and Trifles for Challenge # 40. Thanks Andrew – glad you enjoyed the desert views, I know I did!! Thanks very much Liz. Hard to miss those amazing desert colors! Perfect. Heading back out today to bask in this landscape. 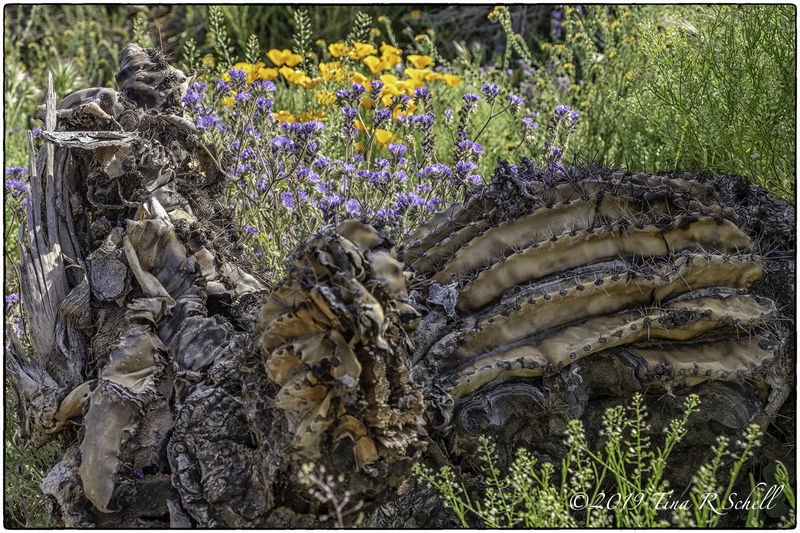 My favorite photo was of the dead saguaro with the flowers growing behind it. Such a contrast and such a message about the desert. 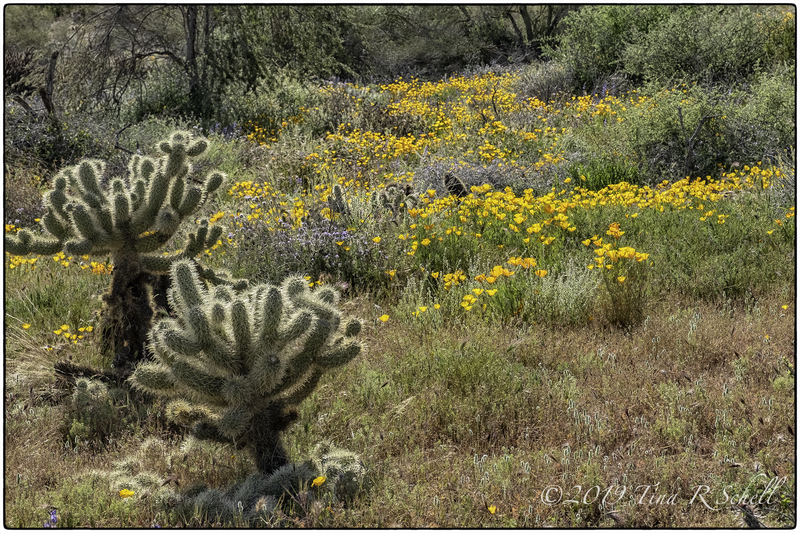 These are incredible photos, Tina, you’ve captured the desert in a way I’ve never seen before ~ it is so alive it looks like as if the cacti are dancing with the flowers, a sight hard to imagine 🙂 Beautiful. Cacti dancing with flowers – wish I’d thought of that Randall😊 always great to hear from you, many thanks my friend! Ooh, how lovely are these! I would never have thought a desert could be so colourful! Nor did I Sue, it was a wonderful surprise! I love good surprises, Tina! WOW gorgeous shots Tina….love the colors…in the dessert…amazing!! quite different from our island! !